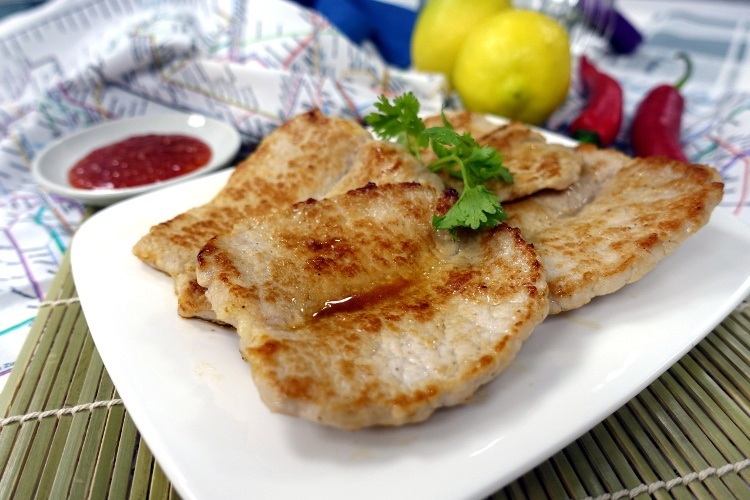 A simple yet yummy pork chop dish using Song-Cho multiply stainless steel Optimal Wok! *You may adjust the seasoning according to personal preference. Marinate pork chops with seasoning for 30 minutes. Add oil into Optimal wok before the wok heats up, turn on high heat. Add marinated pork chops, lower to medium heat. When the edge of the pork chops turned pale and the pork chops slightly reduced in size, flip over. Let them sit till cooked, may flip over again to brown them more. Good on its own or go with rice. 冷锅下油, 开大火, 加入腌好的猪扒, 当中回中火, 煎至旁边变浅色猪扒稍微缩小一点就可翻面.